Here are a few ways to use multiple HD CCTV cameras (AHD, HD-TVI, HDCVI) to Livestream video on Facebook and YouTube. At CCTV Camera Pros, I have helped many customers over the years setup security cameras for live streaming video applications. 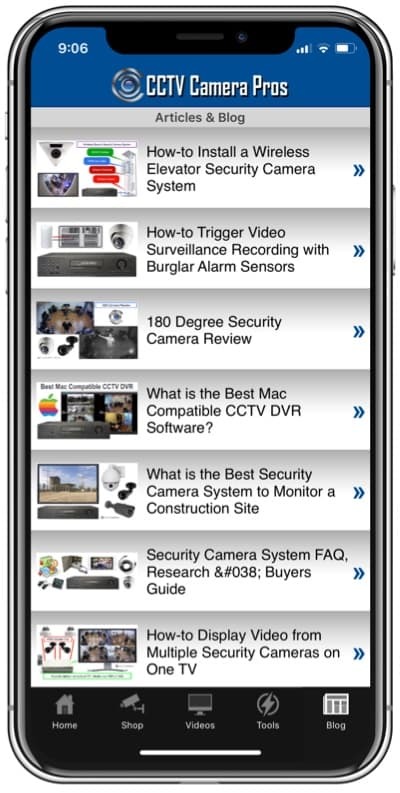 Some of these customers use the same equipment for their security and others use their security camera systems exclusively for live streaming. 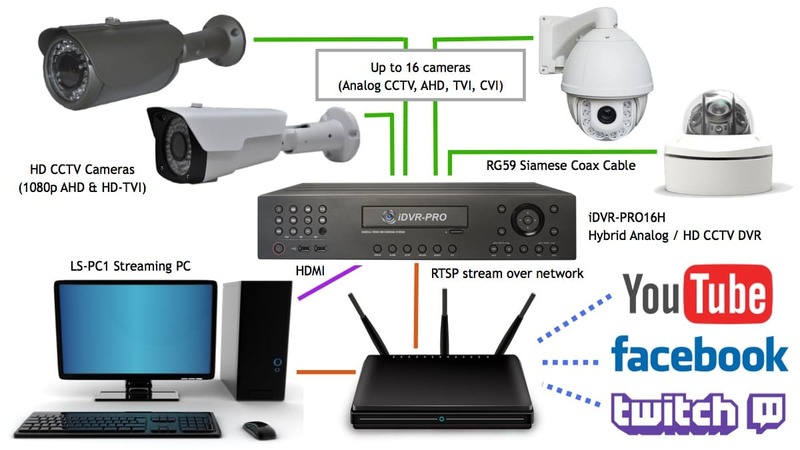 Video multiplexers and surveillance DVRs can both be used for these streaming applications when installed in conjunction with a PC with Open Broadcast software and an HDMI capture card. There are two ways to use a CCTV DVR to live stream: 1) via HDMI 2) RTSP streams. I like the HDMI method better because the RTSP streaming method can be delayed and cause some performance problems with the recording operations of the DVR. The setup is almost the same. This method works best on DVRs that have dual monitor / spot monitor support. The spot monitor setup allows you to have a continuous live video display on the HDMI output while the VGA output can be used to administer the DVR using the menu system. The spot monitor output does not display the menu system or actions being performed on the DVR. You can see this in the below video demo. Up to 16 cameras are hard wired to the DVR using RG59 Siamese coax cable. 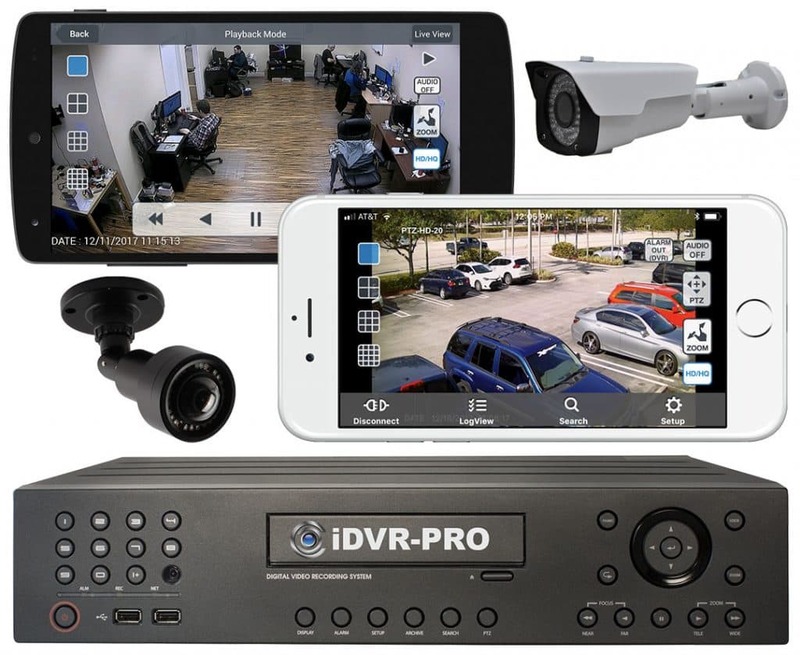 We use an iDVR-PRO16H HD CCTV DVR because of the excellent dual monitor / spot monitor support. The HDMI output of the DVR is configured as a spot monitor. The HDMI output of the DVR is connected to the HDMI input of a Blackmagic capture card on our streaming PC. The PC is running Open Broadcaster Software (OBS). OBS is integrated with YouTube, Facebook, and every major video streaming platform. The streaming PC is connected to the Internet using a network router / modem. This allows OBS to communicate with YouTube, Facebook Live, etc. Instead of using the HDMI output of the DVR, some DVRs give you direct access to the RTSP streams (real time streaming protocol) of each camera. Open Broadcaster Software can access direct RTSP streams as a media source. If you use the RTSP method, you do not need an HDMI capture card on the PC. The PC and DVR just need to be connected to the same local network. I do not recommend the RTSP method because there can be a slight delay in video and also a performance hit on the DVR when you use RTSP. Also, you do not get the benefit of the automated screen sequence of the spot monitor function of the DVR. Watch this video to see an archive of a YouTube livestream using an iDVR-PRO CCTV DVR. Please note that this system can also be used to livestream video to Facebook and other streaming platforms as well. The video also shows how the spot monitor output of the iDVR-PRO can be configured with multiple single and multi-camera views. Please note that this spot monitor function is supported on iDVR-PRO8H and iDVR-PRO16H models. If you have an existing DVR that you want to use and it does not have this dual monitor / spot monitor functionality, you can use a video multiplexer in conjunction with your DVR. 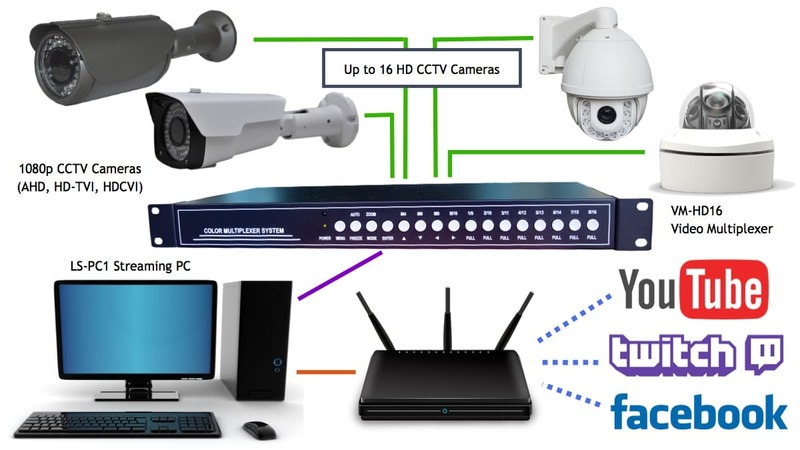 Instead of using a DVR, you can use a CCTV video multiplexer to combine the video signals from multiple cameras into a single view for live streaming. The setup is almost the same. You just replace the DVR with the multiplexer. Up to 16 cameras are hard wired to this 16ch HD CCTV multiplexer using RG59 Siamese coax cable. A mix of 1080p AHD cameras and 1080p HD-TVI cameras are used in this demo. The HDMI output of the multiplexer is connected to the HDMI input of the BlackMagic video capture card installed in the streaming PC. The streaming PC is running Open Broadcaster Software which is integrated with YouTube, Facebook, etc. The PC is on a network that is connected to a high speed internet connection so that the Open Broadcaster Software can stream the video to YouTube, Facebook, etc. Users can switch between different single and multiple camera screen layouts using the infrared wireless remote control of the multiplexer. Watch the above video to see an archive of a YouTube livestream produced by CCTV Camera Pros using this multi-camera livestream video system which includes a video mutliplexer. Have Questions / Need Help? This article covered a few ways to use video surveillance equipment to live stream video on social media platforms. There are other ways. Which one os best for you depends on your requirements and if you have existing equipment. Please feel free to contact me for a free consultation if you would like my advice. 20x Zoom HD PTZ Camera Captures Surveillance Video 550 Feet Away!